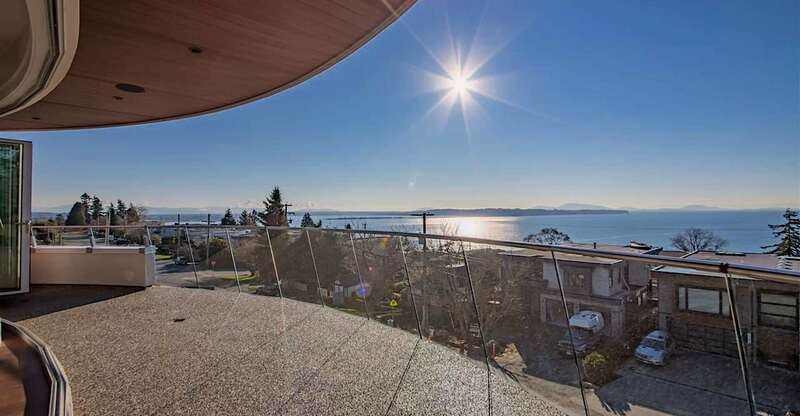 One of the most exclusive penthouse offerings on the market perhaps ever in White Rock is here and it’s a stunner. I grew up just across the water from here but visited the White Rock often and it became a place I grew to love. Living here would be a dream and a place with finishes and views like this don’t come on the market often. The Allure-Elegance penthouse is a spacious home with a deck made for those that love to spend their time outdoors. The view is what will sell most people, but inside you’ll find no expense was spared. A lot of penthouses built lately are nice but usually don’t have quite the space you see here. The Allure-Elegance top floor unit has a whopping 3,290 square feet of living space and you can see below there’s a lot of room for entertaining, dining and just living large. In here you’ll find a chef’s kitchen, three bedrooms and four full bathrooms and your very own private elevator for easy access. The well lit carved walnut ceiling really caught my eye as that level of detail is rarely seen in a condo. The bathrooms here also are a work of art and they feature beautiful stone work and offer a spa-like experience. It has hit the market and is for sale at $2,998,000 CAD and is listed with Sotheby’s agent Dave Snider. To book a viewing of the Allure-Elegance penthouse you can give him a call directly at 604-783-6955 to learn more and perhaps make this your next home.